Live Mascots have a tendency to draw a lot of attention, whether it is being in awe of Auburn’s Golden Eagle gliding around Jordan-Hare stadium as fans yell, “War Eagle,” or thunderous applause of the Sooner Schooner, pulled by impressive white horses named, Boomer and Sooner as Oklahoma takes the field. 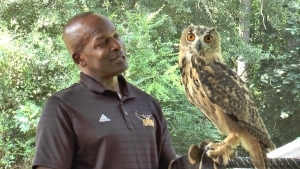 Kennesaw State has introduced Owl fans to its latest addition to the mascot family. A relative in the Great-Horned Owl family that will serve as KSU’s live mascot. The owl mascot is scheduled to be introduced at the Flight Night event on October 19th in the Convocation Center, but there is one detail that has to be addressed before the owl is introduced, naming of the owl. Now, at a glance this may seem like an easy task, but the name of the KSU owl is going to be very important. It is a name that should have legacy potential. Lets take a look at some of the live mascots around college sports to see their impact. First, we have to start with the first ever live mascot, Handsome Dan. The Yale Bulldogs mascot dates back to 1889. According to the legend, Andrew B. Graves, a Yale student and staff on the football team, saw a bulldog sitting in front of a blacksmith shop. 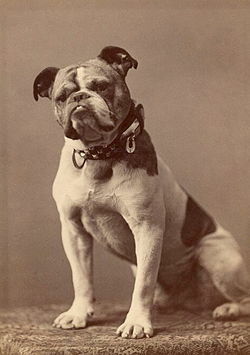 Graves purchased the bulldog and named him “Handsome Dan.” Dan soon made appearances at sporting events with Graves and was adopted by the students as the Yale mascot. Handsome Dan’s tradition of lumbering across the field became legendary. According to Wikipedia, One newspaper reported: “He was a big white bulldog, with one of the greatest faces a dog of that breed (English) ever carried.” Dan’s name lived up to the billing as he won first prize at the Westminster Dog Show. Handsome Dan made is impact on the students at Yale and he lives on in Yale traditions. Several of the Handsome Dan mascots have been preserved and stuffed and placed around the Yale campus as eternal watch dogs. Dan I sits in the Payne Whitney Gymnasium and Dan II guards the Yale Visitor’s Center. 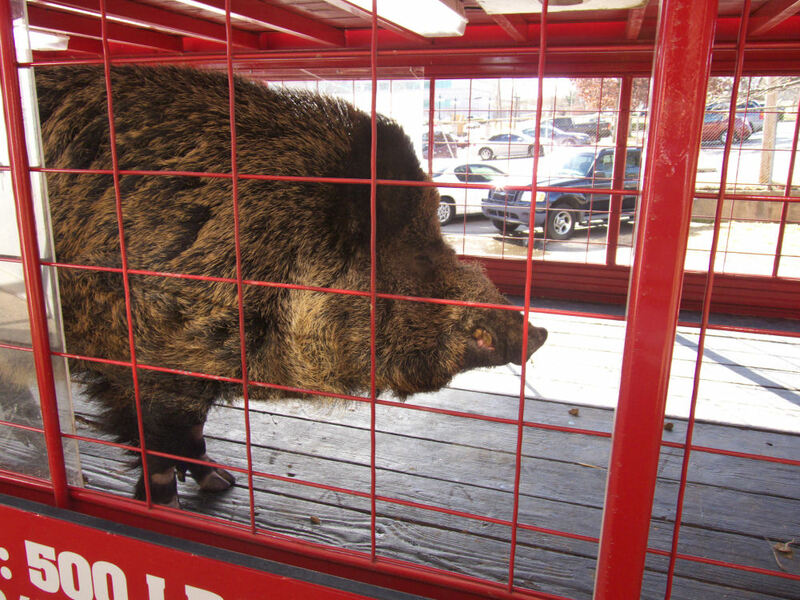 One of the most unusual live mascots in college is the Arkansas Razorbacks live Russian boar named Tusk. Theses mascots weigh upwards of 475 lbs and is one of five live mascots in the SEC (UGA from Georgia, Smokey from Tennessee, War Eagle from Auburn, Sir Big Spur from South Carolina, and Tusk). But Arkansas was not always known as the Razorbacks. In fact, their head football coach, Hugo Bezdek, brought the nickname to the team in 1909 when he introduced the term to Arkansas fans after a 5-0 start to the season. According to hogwired.com, Coach Bezdek met cheering fans at the train station amd gave an impromptu speech, citing, we played “like a wild band of razorback hogs,” after a 16-0 victory over LSU. The term razorback took hold and the following season the students voted to change the mascot from the previous Cardinals to the Razorbacks. A live animal didn’t make its presence until 1960. Several of the live mascots for Arkansas caused a stir off the field while serving as mascot. Big Red III had to be shot by a local farmer after it ravaged the country side and Ragnar killed a coyote, a 450-pound domestic pig and seven rattlesnakes according to hogwired.com. Kennesaw State Athletic Director Vaughn Williams will know the next mascot very well as he spent more than six years with him at UConn. 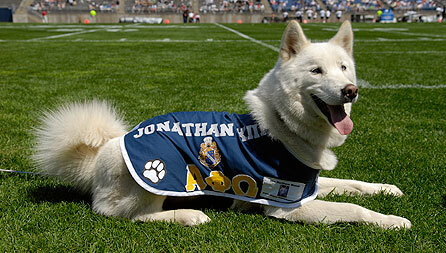 The Connecticut mascot was a white and black husky that is named for Jonathan Trumbull, the first state governor of Connecticut (each subsequent Husky has been all white). Jonathan was introduced in 1935, but went unnamed until 1936. The students named the mascot after a contest brought a live husky mascot to campus. Unfortunately, Jonathan had a rough start. The contest to name him had concluded and the day before the name was announced the unnamed mascot was struck and killed by a car. But the pup originally tabbed to be the first Jonathan had equally attractive cousins and he would become known as Jonanthan II. J-II became a fan favorite when in September 1936 he chased Brown University’s live bear mascot up into a tree. UConn faithful will tell you that the bear refused to leave the tree until rescued by firefighters. Through the years and Jonathans, none became more passionate for UConn athletics than Jonathan IV, who bit Handsome Dan on their first meeting and used to growl at opposing players when they scored in basketball. The Huskies live mascot has represented the team well for more than 78 years and was honored with a bronze statue in the Storrs campus. 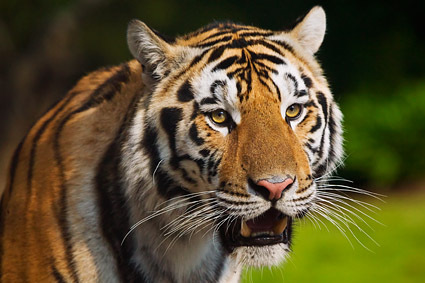 The Louisiana State University tiger mascot is next on the list of live mascots. The tiger known simply as Mike was brought to the campus by Athletic Director trainer Chellis “Mike” Chambers in 1934 after raising the $750 needed to adopt him. Mike served as the LSU mascot for more than twenty years, before his death in 1956. There have been five additional Mike mascots for LSU with Mike VI currently prowling the sidelines at LSU games after being introduce in 2007. There has only been one known incident where Mike escaped his cage. Mike IV had the chain on his cage cut and he roamed out into the middle of North Stadium Drive. He eventually played punch-out with a tree before being tranquilized and returning to his crate. The bears known as “Lady” and “Joy” are the next live mascots featured. Lady and Joy call Baylor University in Waco, Texas. Lady and Joy are nicknames for these two beasts. Joy the larger of the two bears by 10 lbs (Joy weighs 280 lbs). 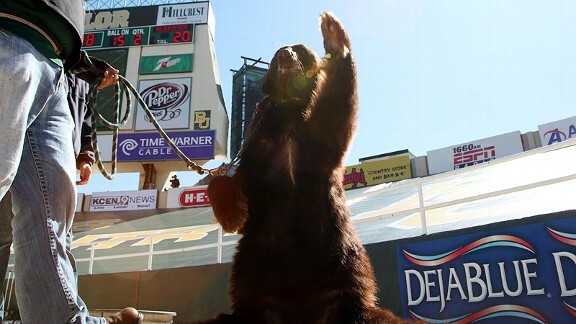 The Baylor Bear tradition of live mascots dates back to December 14, 1914, the students of Baylor voted to have a bear represent the University as mascot. Among the other mascots considered were buffalo, eagle, antelope, bookworm, and bear. The bear won by little more than half of the 406 votes cast. Since then more than 50 North American Black Bears have called Baylor home. The first live bear didn’t come to campus until 1917. All of the bears are named with the prefix of “Judge,” and are usually named after the wives of the university presidents. “Lady” is formally name Judge Sue Sloan, after the wife of the twelfth president of Baylor University, Dr. Robert B. Sloan, Jr. Lady’s nickname comes from Mrs. Sloan serving as the First Lady of Baylor. “Joy” is named Judge Joy Reynolds, wife of the eleventh President of Baylor University, Dr. Herbert H. Reynolds. Both are American Black Bears and were brought to sporting events on leashes to mingle among the fans, until recently. The bears were labeled as “potentially harmful,” by the Department of Agriculture, which required them to be kept away from public events. Kennesaw State is getting a live owl mascot and will be only one of three universities with an owl as a mascot to have an actual live owl. Florida Atlantic (Burrowing Owl) has used a trained owl to fly around the stadium for football and fly to center court for basketball games. Temple just received their live owl this past spring and it is scheduled to make its first appearance September 7, versus Houston Cougars. The live owl for Kennesaw State will be a welcome addition to the tradition that is being built at Kennesaw State and the students will have a chance to name the new owl in a contest hosted by the athletic department. The naming contest will begin on Sept. 25 and fans will have the opportunity to submit their favorite name by filling out a form on the athletics website or through twitter. Posted on September 7, 2013, in Uncategorized. Bookmark the permalink. Leave a comment.